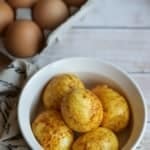 Masala Egg roast is perfect for days when you want to make a quick, simple, and healthy dish to feed your kids when they come home ravenously hungry after school or from their activities. You have just picked up kids from school, and they are ravenously hungry. While you are hurrying to get your dinner ready, the kids are checking out the snack bin – Mom, can I please have some <insert some junk food> ? You want to tell them “Dinner will be ready in 30 minutes” or ” That will ruin your appetite for dinner” but try saying that to a kid who is hungry and a tantrum is sure to follow. Get some leftover boiled eggs from the refrigerator, stir fry it in a bit of oil, and some salt, turmeric and chili powder. Ta..da.. Your Masala Egg roast is ready to serve in 5 minutes or less. Mom saves the day and buys some time to cook the evening’s meal peacefully (hopefully). Kids are happy and off to doing their homework (..again hopefully). A little history on this recipe. 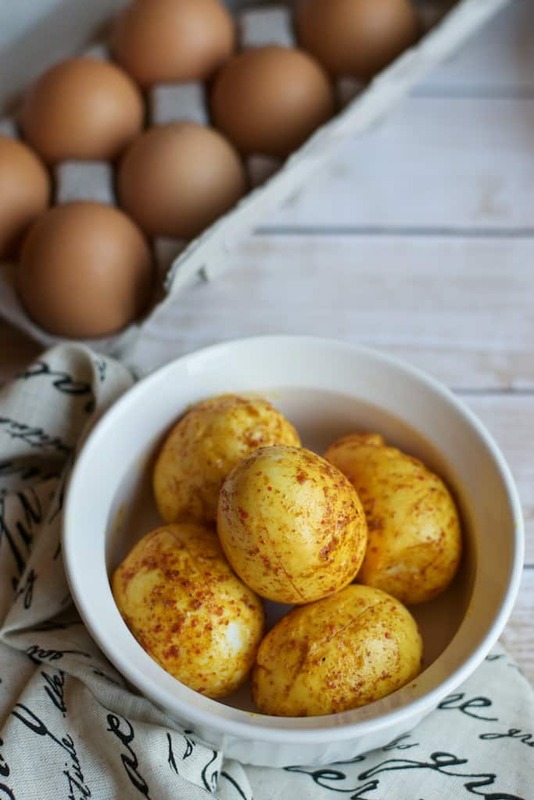 Masala Egg Roast is a must-have item in the baby shower (also called as Bayake) ceremony for folks who hail from the Bunt community in Mangalore. This ceremony is usually held on the 5th, 7th or the 9th month. During the baby shower, the soon to be mom feeds this Masala Egg roast to a boy and a girl child. If the mom desires a girl, she would feed a girl child first or vice versa. As a kid, I thought that was a pretty fascinating and would always wanted the first one to be fed the egg. That was so, because for one – I loved Masala Egg roast and second – I would be damn hungry by the time the ceremony started. Hope you enjoyed this post. I am always on the lookout for easy to make after school snacks. If you have one, please leave a comment and let me know. In a small bowl, add oil, turmeric powder, salt and chili powder and mix well. Make 4 equidistant slits on the boiled eggs with a knife ( don't cut them too deep). Add the boiled eggs to the oil-spice mixture and coat the eggs till they are fully covered in the mixture. On medium heat, heat a pan and then add the boiled eggs along with the mixture. Swirl the pan every minute or so to prevent eggs from sticking to the pan. Cook for 3-4 minutes and take off heat.